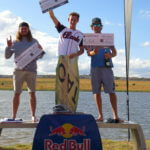 Everyone got their fix of Wakeboarding action this past weekend, as the King of Stoke took place on Saturday 6 April. The crowd watched the up-and-coming wakeboarders in various divisions battling it out over the flat water, kickers and sliders for valuable points. The competition got underway at 9am with the qualifying rounds and finals starting around 12pm. The aim of the King of Stoke contest, was to introduce new riders to the competition element of the sport, gaining valuable experience when having to perform under pressure. The over 19 (Senior) Men’s division, had riders aged from 19 to over 45. 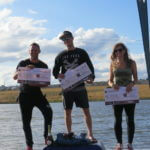 It was fantastic to watch the ‘weekend warriors’ enter and have a blast on the water, all first-time competition riders. Special mention to Katherine Stott and Sanchia Fairweather for being the only ladies on the water. These guys enjoy spending weekends at the cable, and some manage to get in some mid-week riding. This paid off for Edward Copley who was crowned King of Stoke. He has only been riding for a couple of months, and his time on the water paid off. Second place went to Katt Stott, who had a fantastically clean and solid run. StokeCity AdventurePark Manager, Perino Hanack, placed 3rd. It was super exciting to watch the under 19 division of more than 14 riders showcasing the skills they’ve been acquiring over the last season. The Junior Men division is the breeding ground for the future wakeboarders, this is where they have to learn to handle the pressure and be focused on their riding. There were three U12 contestants, all showing some exceptional skills, and the youngest entrant, Kayson Holtzhauzen (11) made it through to the finals, and placed 6th overall. The Junior King of Stoke title went to StokeCity local, Liam Wooton with his stylish flat-water tricks. 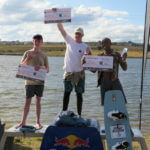 Prince Mashaba placed second and Jason Pearce finished in 3rd place. The wakeskate division is always super exciting to watch. It’s amazing to see the riders put their skates through their paces on the water. Jacques Labuschagne who has been skating for some time now, pulled out all the stops to take 1st place. He was closely followed by Kyle Holtzhauzen in 2nd place and Daniel Steyn taking the 3rd spot. Special mention to everyone involved in making the day a great success and our phenomenal sponsors: RedBull South Africa, LiquidForce South Africa, Gone Skiing, Thule and Drones & Cool Things. A contingent of development riders from the Learn2Ride Development programme entered. The programme aims to introduce previously disadvantaged individuals to the sport of Cable wakeboarding. StokeCity AdventurePark has been working closely with the South African Waterski Federation over the last couple of years, and there are roughly 8 participants currently. The hard work paid off, and having put in hours and hours on the water, Prince Mashaba, got a podium spot in the under 19 division!